DeNA has launched its newest game on iOS and Android devices: Qube Kingdom. The tower defense game sees players defending the Six Kingdoms of Qubria from invaders, by placing warriors with different skills and powers on the path in front of their enemies. In each encounter, users can draw a the hero of another player or friend into the battle with them for additional strength. They have as much time as they need to prepare for the battle, placing archers, swordsmen, wizards, barbarians and others on the path, until they run out of resources to do so. Once users trigger the battle, combat takes place automatically, and users earn additional resources from fallen enemies. If everything is going smoothly, gamers can trigger 2x or 4x speed increases to make battles progress more quickly. If heroes fall in battle, they’ll regenerate after a short time. This is important, as users are limited to the number of forces they can deploy in each stage. In addition, special power cubes are scattered nearby paths, which may cause an offensive attack or a defensive weakness when activated. These cubes are activated when multiple enemies are slain in their general location, and may give players access to special fire attacks, or they may open new paths for the enemies to quickly reach the end of the area, as examples. Players can choose from three difficulty settings for each level, and an energy system limits the number of games one can play in a single session. 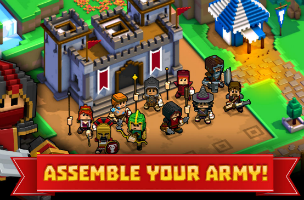 Excess resources can increase a unit’s strength or health stats while playing, and gamers can use their collected cubes (currency) to summon new heroes for their teams, or upgrade their existing units. Qube Kingdom is available to download for free on iTunes and Google Play. It’s currently featured as a Best New Game on iTunes.